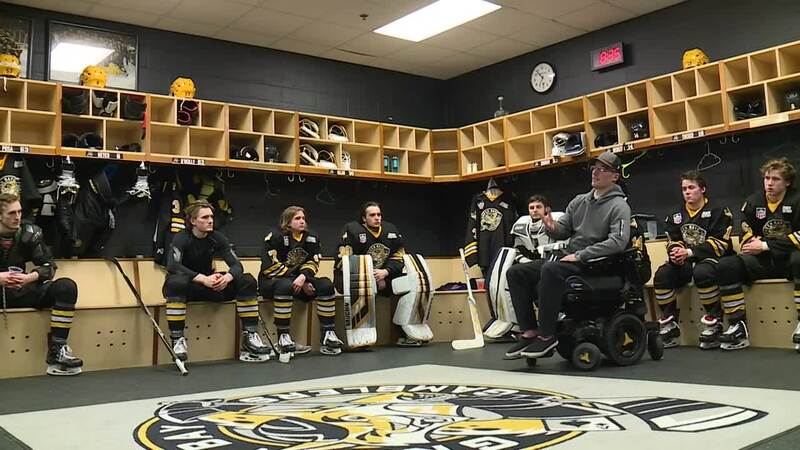 GREEN BAY, Wis. — It's the last Gamblers home game of the season and the team is about to get a pep talk from an old friend. "I'd be lying if I said there weren't some nerves," guest speaker A.J. Degenhardt admitted. Degenhardt is no stranger to this old barn. He played here for the Gamblers from 2000 to 2002. But the last time he was in the Resch Center was 2006, then as a member of the Wisconsin Badgers. They beat Cornell that night in an NCAA Regional Championship game in triple overtime. "Right now, I'm sitting in a wheelchair," Degenhardt said. "This is my reality now." Degenhardt is battling multiple sclerosis, a disease he was diagnosed with back in 2009. "Being a tough hockey player like I pretended I was, I thought everything was fine," he said. "I had MS and the rest is sort of history." It's MS Night at the Resch Center and the team has asked A.J. back to be a part of it. "When they invited me to the game, there was no way I was going to miss it," Degenhardt said. It's time. The locker room door opens and Degenhardt enters. "How we doing guys?" he said. The Gamblers are all ears. "I think it's 20 years ago now I that I played here and sat in those seats that you guys are in. Some of my best memories in my life were made being in your guys shoes right now. Cherish that. Make the most of of it and lay it on the line for the guys one more time." A round of applause. A trip down memory lane and a reminder that no battle is too big for a tough hockey player like A.J. Degenhardt.